Painting and drawing wildlife is one of my favourite pastimes. Whether its Otters, Pine Martens, Wildcats or Badgers, I always get such a buzz out of trying to do them justice. This allows me to get away from the more rigid confines of illustration, to experiment and try to accentuate the true character and spirit of the animals I depict. I am happy to discuss any ideas you might have for a private commission, either for yourself or for a friend or relative. It might be to commemorate a special day or place where you saw a particular animal. Let your imagination run riot! Please contact me for more information or a quote. You can also buy an ARTful Creatures Gift Voucher, which then allows the recipient to choose their own subject. 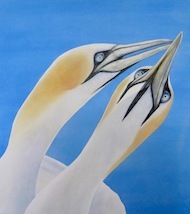 Take a browse through the Wildlife Portfolio for an idea of the sort of paintings and drawings I produce.